When you need heavy haul perimeter trailers, you need Sims Crane & Equipment. Sims Crane & Equipment is a family-owned and operated crane company with all of the tools, equipment, services, and resources you need to complete your jobs on time and within budget. Our diamond 13 axle perimeter trailers include a parameter trailer deck and feature 95 ton maximum capacity to cater to nearly any sized load. In addition, they boast a 30’ deck length that is stretchable to 90’, 10’-20’ deck widths, and a 1’2” deck height for improved ease of use. We also offer our 24 axle Trail King trailers, which can suspend loads from the perimeter beams or carry loads underneath on its trailers to evenly distributes loads over the tires. Better still, they feature 20’ to 100’ extendable wells and allow for independent steering with hydraulic power and four diesel engines. Sims Crane & Equipment is a respected crane company, and we have a wide selection of equipment for both sale and rent at each of our 13 Florida locations, including mobile cranes, rough terrain cranes, tower cranes, forklifts, material hoists, and more. Our equipment is all regularly maintained and inspected, so you can always count on the reliability of the equipment you rent from us. We are also renowned for our value-added services, which include machinery moving, safety education, 3D lift planning, and more. 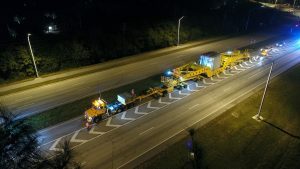 If you are in Tampa or elsewhere throughout Florida and are looking for a crane company to partner with for heavy haul perimeter trailers, crane rentals, parts and service, or any other industrial equipment need, contact us today for more information.